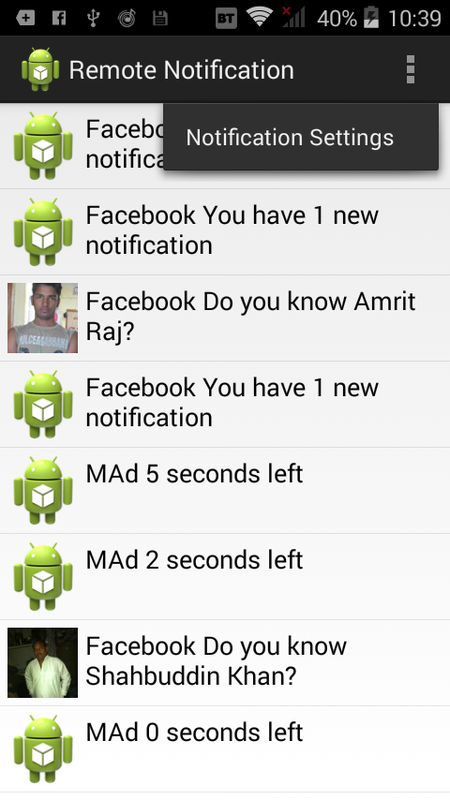 Today, I am going to share a small tutorial on android "NotificationListenerService"
Implement this method to learn when notifications are removed. * Created by mukesh on 19/5/15. for which app you are fetching the image...in some app notification we didn't received image so in that case I am showing app icon launcher. This app reads all notifications? If I receive the first notification I can read all informations, but when I receive the second notification I cant- read all informations because it is append to first notifications. In the status bar the two notifications of same app are in an only notification. How can I read it? 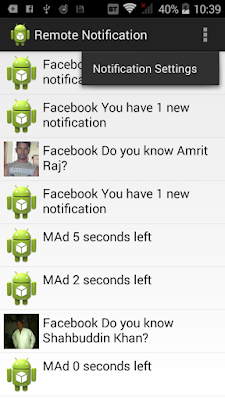 add start sticky in notification service class. 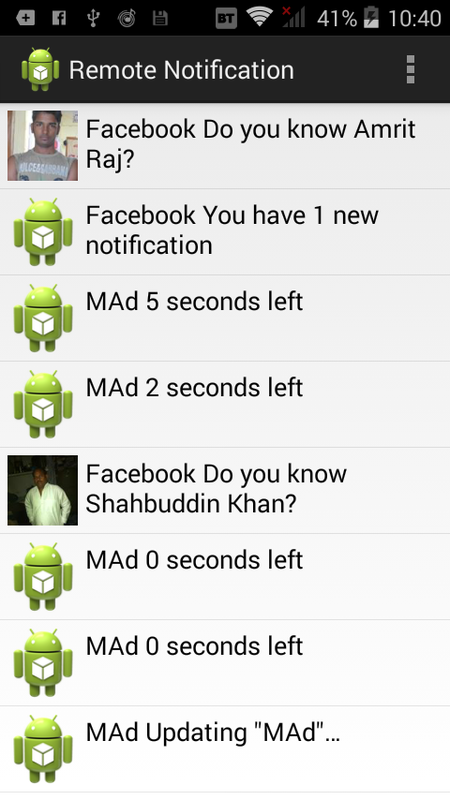 hi, can you plase send me a code for reading whatsapp messages into android app. I already attach the complete code in this post. Check it. Its helps to read your whatsapp messages too. Bute while i run this code from github, nothing is displayed below the actionbar with heading remote notification. May be you didn't enable the Notification listener from setting menu, turn on and then try. How to turn on it.? Can you please give the code that reads only whatsapp messages? Hi. Thanks a lot for this code. I wonder how to run this app in background right from boot up. Currently it works, only if I open it. same thing i also want. hi Mukesh if any solutions is there plz kindly share the information regarding this. brilliant code... well done, but yaar i have 1 question. Now what if i want it to give me a list of present(Current) notifications that are alive in the StatusBar.. but havent been attended to? "Extras no be resolved and not a field"? 2.When i navigate screen the previous notification that are present in statusbar aren't shown in app.I want to show until user click clear notification. Hi,How to show corresponding app icon on left side of notification rather than default icon? check below block of code where I am checking if there is a user profile then we are showing his pic else default app launcher icon. Modify the code acc. to you. which min API I need to use NotificationListener ? Thanks a lot Mukesh for the code. I think you should also make video tutorials as your a very talented guy and it would help a lot of people. Thanks dear will try to make the youtube video blog. in my code CustomListAdapter cannot be resolved to a type..
Hello, Firsly thanks for post. I took source code and run. 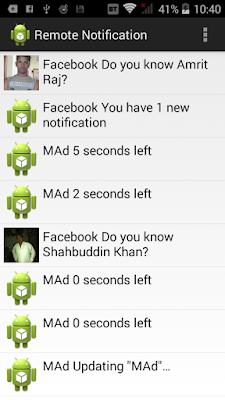 it runs , when facebook or other apss notifications comes, it shows but for whatsapp it doesn't . Second one is when i close app it doesnt work. Can u explain the solution for these two problems ? Yes you can make Arraylist of Model class where you can store the data. I don't know your exact requirement but what i suggest is storing the model class data in DB is a best way. how to get hatsapp number from notification detail? Hello Kanika,If the number saved on your device then it will show you contact name else it will show mobile number on ticker, you have to fetch number based on name if it is saved.